A Post About Ashton Kutcher? Do you ever find yourself clicking one link after another online until you get to something that has nothing to do with the original search? That’s what happened with this Ashton Kutcher thing. I literally can’t remember the original search, but it was probably something involving yoga pants or cats. It really doesn’t matter at this point. What matters is that I found this random Ashton Kutcher video that apparently went somewhat viral a few months ago, and it was actually quite thought provoking. You can watch it here before I comment on it if you’d like. Build your own life, don’t just occupy other lives. It’s the first and third points that got the most attention. 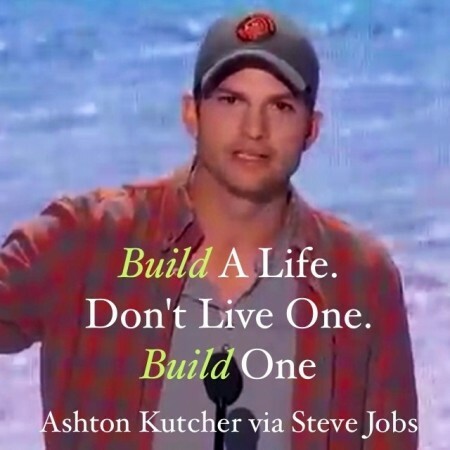 Kutcher later said that he worries about the culture of fame that’s propagated by Hollywood and reality TV–he sees young people who aspire to be famous instead of aspiring to work hard and build something new and unique. I think he makes some great points, and I applaud him for doing so on a platform that probably isn’t ever used for that kind of advice. However, disconcertingly and ironically, listen to the audience’s response, especially as Kutcher is ramping up to his key points. There is a neverending chorus of “woooooos” and catcalls and “we love you Ashton!” It’s hard to watch this guy try to give an insightful speech to an audience that…well, I’ll just say it: They sound like idiots. His second point hit home with me personally, because that’s exactly how I want to run and grow my business. I want to run a thoughtful, generous, smart business, and I want to support businesses that aspire to do the same. It was great to hear someone as successful as Kutcher affirm that. If you watch the video, I’d love to hear your thoughts. This entry was posted on Monday, November 11th, 2013 at 9:59 pm	and is filed under leadership, life lessons and tagged with leadership. You can follow any responses to this entry through the RSS 2.0 feed. The other reason to post about him is because he’s so dreeeeeeeamy, right? On a more serious note, I was pretty impressed by this sentiment. There’s always a bit of disconnect when someone of celebrity status makes comments to an audience that he has an entirely different set of advantages over, but the points made were no less fantastic. Let’s just hope that at least one person who saw it thought more than “what an awesome thing to say” and really took it to heart. Now I’m just mad. I posted a link to this amazing video in a comment on one of your posts like 2 months ago! So that means you never watched it from my comment. Booo. 🙁 Sad face. Anyway, yes, the speech was amazing. And so unexpected. Great job Ashton…err, I mean Christopher. Oh no! You totally did! I reply to comments at work, but I don’t watch videos. I must have forgotten to go back and watch it after I got home. I promise I’ll watch the next video you share, Leandra. Also, I thought it was a little odd that he shared his “real” name. It wasn’t an important revelation, and it didn’t seem to fit in with the rest of the speech. Since this same video became part of a political spectacle, I’d watched the video awhile back. I also think that this video is incredibly insightful if not at least, heartfelt. As to the name, my theory is that, having come from an actor and former model, he wanted to disclose the cards close to his chest. Not to mention and well, it is what it is, aside from the movie about Steve Jobs, people had pigeonholed him a bit. He’s quite smart and earnest. He would have been a Biochemical Engineer had he completed his studies. Now as far as other aspects of his life, well, that’s another discussion.